Firefighters donning HazMat gear enter Widmer Brothers Pub and Brewery to locate the ammonia leak. 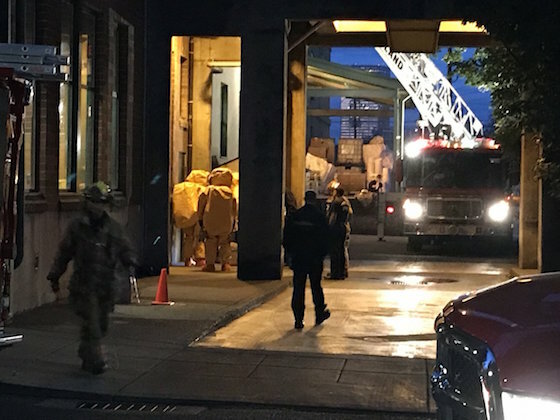 An ammonia leak at the Widmer Brothers Pub and Brewery in North Portland, OR, prompted an evacuation of the building early Thursday morning. Employees noticed the smell and evacuated the building. Nobody was hurt. PF&R said workers at the brewery were evacuated due to an anhydrous ammonia leak. Anhydrous ammonia is a toxic and colorless gas with what’s described as pungent and suffocating fumes that can irritate the eyes, nose and throat, cause burns, or even death. HazMat trained firefighters geared up and went inside the building to locate the leak. PF&R said the source of the leak was located in the basement. Firefighters were then able to shut off valves and stopped the leak. No injuries have been reported.